Transferrin receptor (TfR) is present on the surface of all cells, with the highest concentration found on erythroid precursors. Soluble TfR (sTfR) is detectable in the plasma, and its concentration increases in iron deficiency. Other causes of increased sTfR include increased erythropoiesis, such as occurs in hemolytic anemia, megaloblastic anemia and myelodysplastic syndrome. Causes of decreased sTfR include iron overload and decreased erythropoiesis, such as occurs in aplastic anemia and bone marrow ablation. Serum ferritin and sTfR levels reflect different stages of iron deficiency. In early iron deficiency serum ferritin levels decline as iron stores decrease. Only when iron stores are fully depleted do sTfR levels begin to rise, reflecting tissue iron deficiency and iron-deficient erythropoiesis. Only at this late stage will transferrin saturation, MCV and hemoglobin begin to decrease. The distinction between iron deficiency anemia (IDA) and anemia of chronic disease (ACD) is of great clinical importance, since unexplained IDA warrants extensive evaluation of the GI tract for a possible source of chronic blood loss. ACD is the second most prevalent cause of anemia, after IDA. It occurs in patients with acute or chronic immune activation, and is associated with increased uptake and retention of iron by cells of the reticuloendothelial system, with subsequent decreased availability of iron for erythropoiesis. Standard measures of iron status (specifically serum transferrin and ferritin levels) are often adequate for this differentiation, as shown below. In patients who have a known chronic inflammatory disorder standard measures of iron status may not be able to clearly identify iron deficiency, especially when it coexists with ACD, due to a misleading acute phase elevation of serum ferritin. A bone marrow examination may be required to evaluate iron stores. In this situation sTfR is very useful, because the level increases when iron deficiency is present, even when it coexists with ACD. STrR is normal in ACD alone. There is evidence that a serum ferritin <30 ug/L in patients with anemia and concurrent inflammatory disease is a reliable indicator of iron deficiency (92-98% PPV). On the other hand, iron deficiency is unlikely if the ferritin level is >100 ug/L. 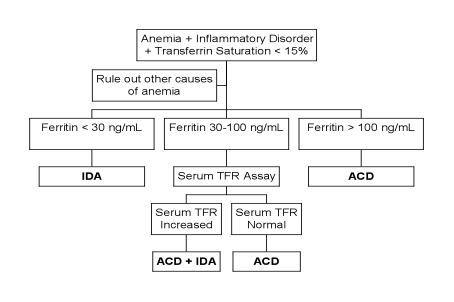 The following algorithm illustrates the recommended approach to the differential diagnosis of anemia in patients with inflammatory disorders. With this approach, the need for a bone marrow examination to evaluate iron stores may be avoided in many cases. The serum transferrin receptor assay has also been shown to be useful in predicting an erythroid response to erythropoietin in patients with chronic renal failure. A low transferrin receptor value together with a normal to increased serum ferritin level, indicating decreased erythroid activity and adequate iron stores, predicts that a response to erythropoietin is likely to occur. An elevated transferrin receptor level or a low ferritin value indicates that a response is unlikely due to associated iron deficiency, suggesting that iron replacement may be required. The sample requirement is one red-top tube of blood. Reference range is 0.80-2.00 mg/L. Values do not differ between males and females.